A few years back, I found on my bookcase a specimen of one of fantasy's rarest creatures: a comic fantasy named Glass Dragons. Initially enjoying it, I resolved to pick it up again - and review it with my newly critical gaze. Does it stand up to a reread? The answer is most probably an emphatic "no". Comic fantasy is admittedly a difficult genre to carry off well. Plenty have failed. Some, like Joe Abercrombie, have carried the trick with remarkable flair - and it's only a pity that Glass Dragons, by Sean McMullen, can't be numbered amongst them. Our two protagonists - a Laurel and Hardy-esque pair - are one trick ponies. Wallas is fat. Andry is thin. Wallas is aristocratic and crass. Andry is lowborn and noble. Wallas has luck with women. Andry doesn't - but later they turn round and love him anyway. *Cough* Excuse me? Just how long ago was it that they wouldn't speak to him? Ah, yes. Two minutes. Wallas, a Master of Royal Music accused of assassination (despite the steadily proliferating evidence to the contrary), flees the Emperor's palace to a nearby tavern, there meeting Andry, surviving a night's carousing though the waterfront - and then accompanying him the next day. Meanwhile, an etheric device is being constructed: the Dragonwall - and it's only a matter of time before one of the involved sorcerers realise that the entire capability of Dragonwall is available to anyone. It's a thin premise, and as Andry and Wallas stumble from slapstick into misjudged love, it only becomes less believable. They're torn from political conflict to etheric machinery in laughably little time - whereupon nobody mentions the previous events. Granted, there are moments of genuine humour - dialogue is amusingly plotted, fast-paced, and hilarious - but insipid, generic characterisation and reused reactions - women to Andry and Wallas, for example - quickly become repetitive. I'm sorry I couldn't like it on reread - but it's a world that works on first try, and it's worth a look for fans of the genre. Otherwise, Glass Dragons won't be making my recommendations. Well, love the cover picture?!? This is a great review. You are honest yet don't destroy the book. I like that. That makes me feel better reading this review that you are honest but don't completely tear the book apart. Sounds as though it is good for a read when you need one though. As you can probably tell I am back up and running now. I am reading some blogs then I will do my Wed. post then to yours! I want to do yours last so it is the one that every one will see first when they stop by. Hi Jacob, just came from Melissa @ My World where I read your guest post - very interesting even though I'm not normally into this type of read. 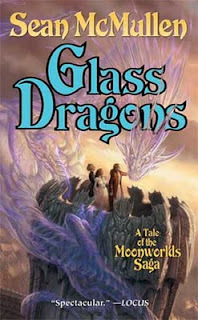 I also enjoyed your review of Glass Dragons, a posssible christmas present for Hubby who does enjoy this type of book. Anyway, nice to meet you. Thanks for the comments - I regretted not being able to like the book on reread, but the majority wouldn't make my recommendations. Nevertheless, there were some good moments - my feeling is that it could have been cut down to a shorter, snappier, funnier novel without the repition and concentrating on a single plotline.